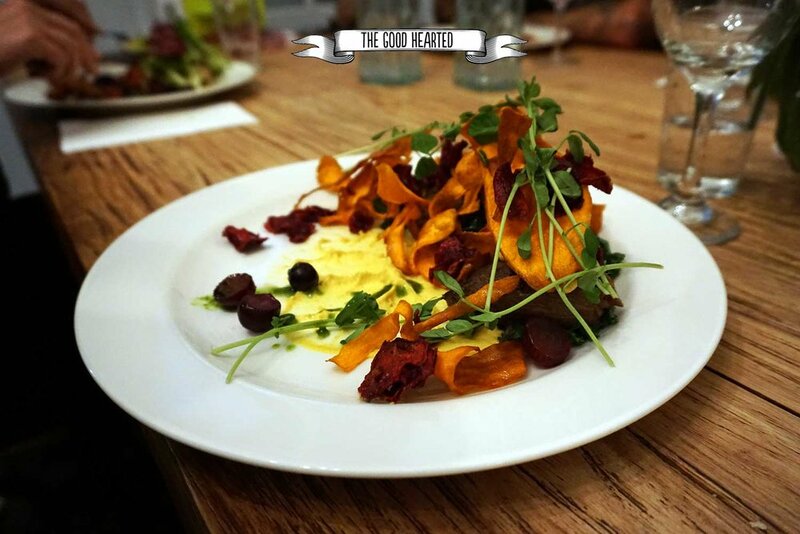 Billy & Lucy is a friendly all vegan, organic restaurant in Fitzroy. Vegetables and whole foods are the heroes of the largely gluten free menu, with no mock meat to be found. Creative dishes include a ‘Roasted Mushroom Tahini Crust Tart’ ($18) which is an entree, but could pass as a main dish with its generous fresh garden salad and barbecued picked onions. The much enjoyed ‘Sweet Potato Gnocchi’ ($23 GF) is a bit of a signature dish and includes confit tomato, maple spiced almonds and a thyme and cauliflower puree. Billy & Lucy proudly support the Coalition for the Protection of Racehorses by displaying a large “You Bet, They Die” banner out the front, and we think that’s pretty cool. 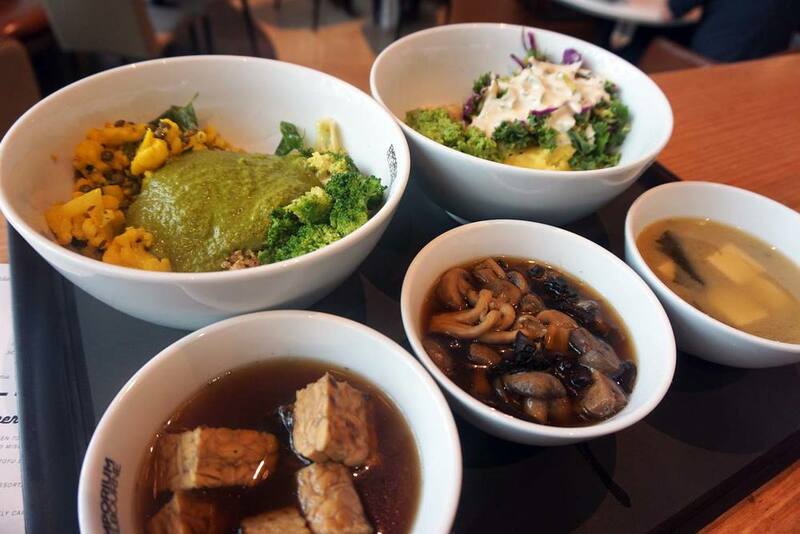 Loving Hut is an all vegan restaurant chain with over 200 stores worldwide, each offering different menus and qualities of service, but all united in the goal of bringing affordable vegan meals to the public. Behind the sect-like glowing signage, yellow walls, plastic bamboo, and tv screen illuminating Batman cartoons (on mute thankfully), Northcote Loving Hut is a damn good place for a consistently delicious meal, and it's huge interior makes it an easy choice for last minute dining if you have a big group to feed. The menu offers a boundless array of everything that seems non-vegan at a glance. We're talking about dishes such as 'Southern fried chicken' ($16) (or 'The volcano' ($17) if your partial to smothering said dish in hot sauce), 'Lemon chicken' ($14), 'Katsu duck with plum sauce' ($14), 'Pan fried tuna fillet' ($13) and the list goes on and it's all vegan. My favourite dish of the moment is 'Bambam' ($15), which is deep fried eggplant or prawns with creamy sriracha infused mayo on top, and puffed tofu. Loving Hut also do an authentic vegan 'Silken tofu pad thai' ($13), a classic 'Curry laksa' ($12) and various rice, noodle and vegetable dishes. 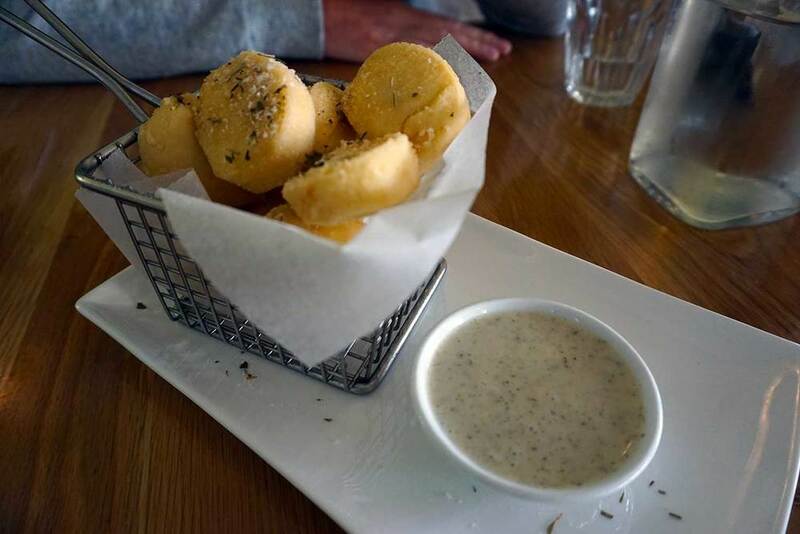 There are almost 50 items on the menu, so I won't even attempt to list them all, but I will let you know that many can be ordered as gluten free, onion free and garlic free. Desserts are also an option, with Zebra dream organic coconut ice-cream scoops, banana fritters, and an array of cakes and La Panella Bakery style baked goods, such as lemon tarts and caramel slice. Head to the big freezer to secure a bulk pack of vegan hot dogs or bacon (these ones aren't classified by the World Health Organisation as being group 1 carcinogens - yay! ), and there's usually a good supply of veganpet and v-dog (which is hard to find) pet food to snap up for your fur kids. 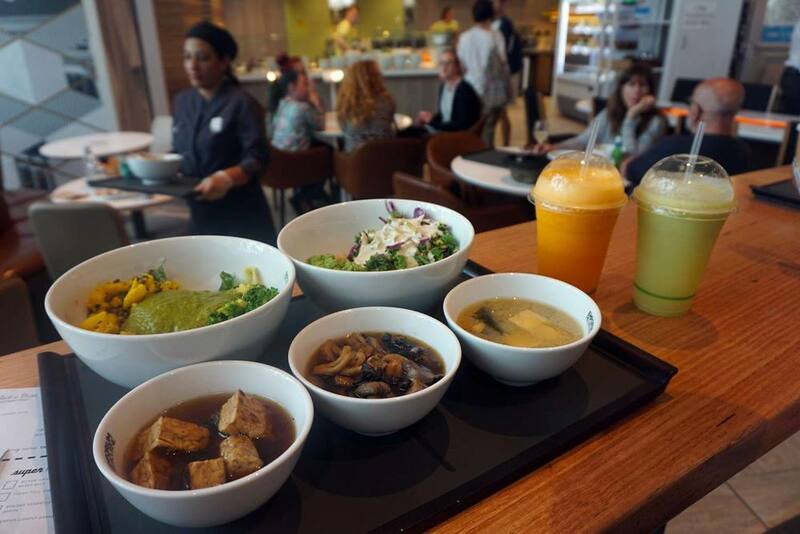 The majority of Melbourne vegans need no introduction to the wholesome and delicious food on offer at Yong Green Food, and the midweek queues out the door are testament to the fact that the word has truly gotten around! 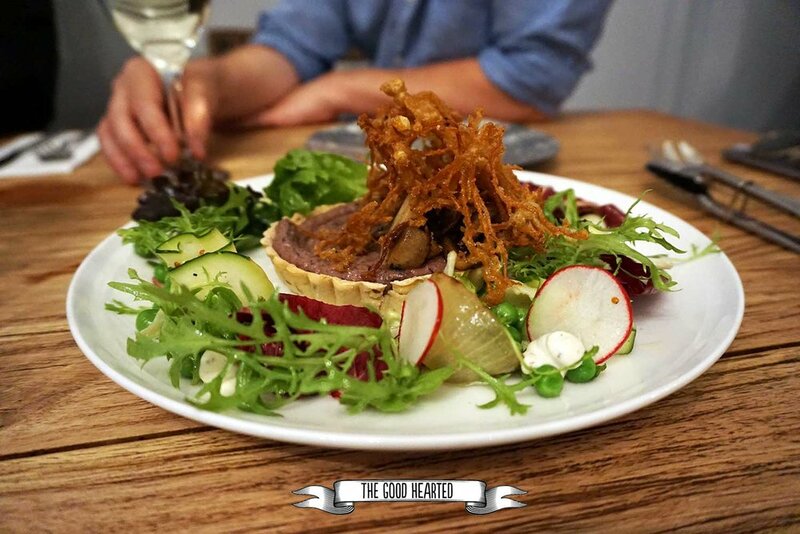 Yong Green Food offers an extensive all vegetarian (mostly vegan) menu with an abundance of gluten free options - along with raw, organic and biodynamic dishes. On our recent visit, we opted for the 'Oyster Mushroom Calamari' (GF $10.50), which was so incredible that I fear I won't try other menu options in the future in case they don't live up to this dish! The organic king oyster mushrooms are deep fried in organic rice butter (drool…) and served with salad, jalapeno marinara and vegan aioli sauces - clearly this dish is a 'must-try'. 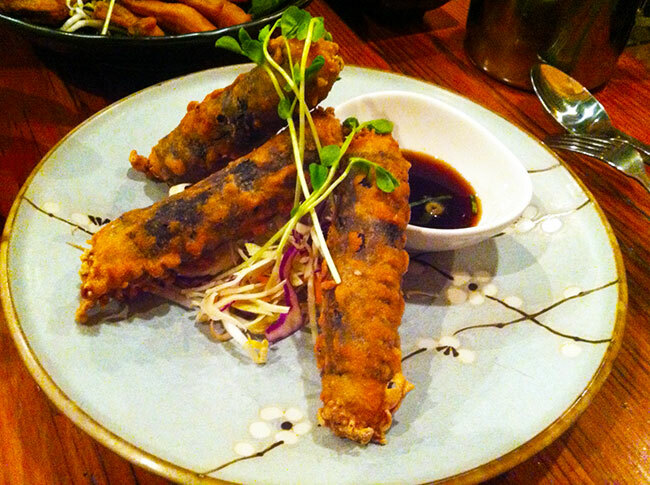 Another delight from the snack menu are the 'Fried Nori Rolls' (GF $12.50) which are long, thin rice battered fried nori rolls of mung bean noodles, tofu and veggies. As stunning as this dish was, it didn't pip the oyster mushroom calamari at the post. For mains, my sidekick gave the hearty 'Japanese Curry' ($15.50) a go - which had potato, carrot, mushroom, peas and sliced soy beef in a mild curry sauce with biodynamic brown rice. I'm not sure how many Japanese curries he's tried, but he did proclaim it the best he's had, which is a pretty damn encouraging recommendation. I went for the most medicinally dangerous sounding dish on the menu - the 'Macro Dragon Bowl' (GF $18), without onion and garlic (OGF optional), which is a truly nutritious delight of biodynamic brown rice topped with assorted vegetables (including amazing shitake mushrooms), organic tempeh, seaweed and lemon tahini cream. As if all that doesn't sound fulfilling enough, the dragon bowl is also served with miso soup. 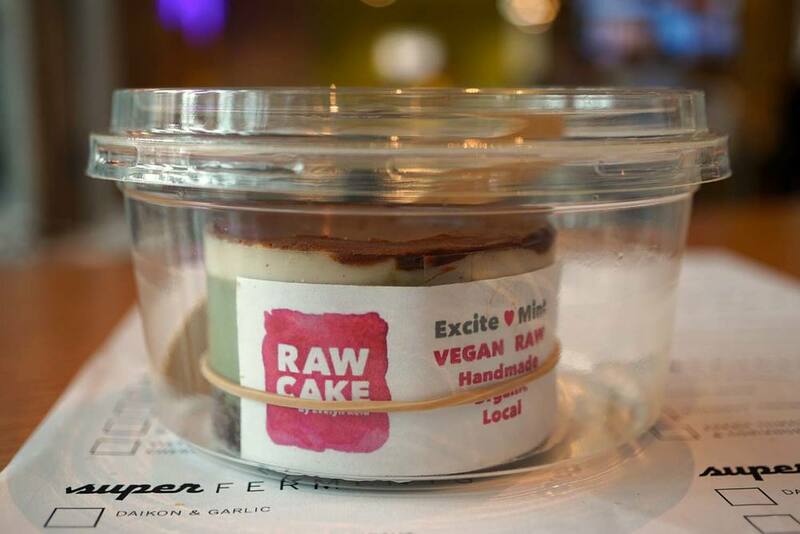 We took home a sneaky slice of organic 'Raw Chocolate Cheesecake' (GF $8.50) which is predominately made of cashew nuts, and I liked that it didn't have the strong coconut oil aftertaste that some raw chocolate desserts can have. We also wanted a slice of the organic 'Raw Pecan Pie' with cashew cream ($9) but alas, it's high demand had caused a sell out - which was no real problem for us really, because we'll be back at Yongs in no time. What do you do when you're out in the 'vegan-friendly-eatery-starved' eastern suburbs, and dinner time creeps up on you? 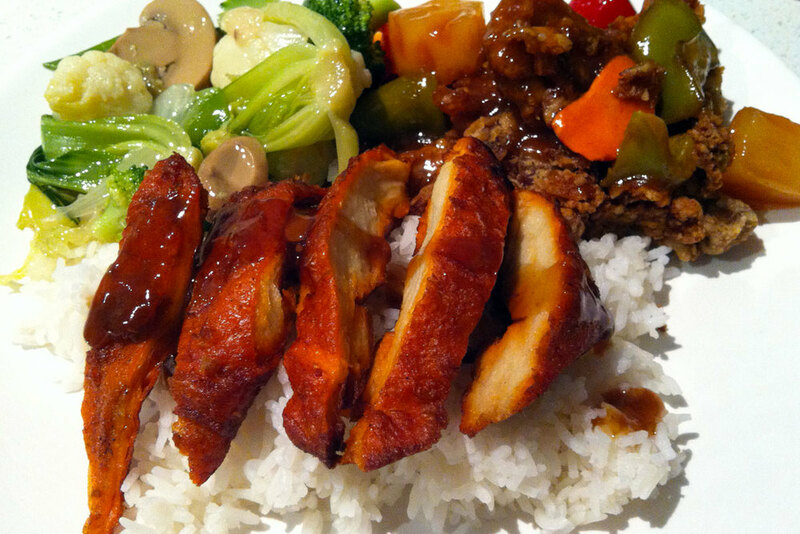 You swing by the all vegetarian Malaysian restaurant 'Vegie Mum' in Doncaster of course! The menu here is really large (the menu numbering goes up to 98!) and all dishes without egg are vegan, aside from the honey 'chicken', due to… aah, honey. There are plenty of mock options including seafood, duck, chicken, beef/lamb and pork. There are also soups, hot pots, noodles, rice dishes, a variety of vegetable dishes, entrees and roti. This much choice makes my brain hurt! The dining area is more functional than pleasing aesthetically, which was neither here nor there for us as we were in the market for takeaway. On recommendation from the staff we ordered the Crispy Sweet and Sour Abalone Mushroom ($13.50), and also chose the Roasted 'Duck' ($14), Chinese Mushroom with Pok Choy ($15.50) and some Satay Skewers (2 sticks $4) as an entree. The crispy sweet and sour abalone mushroom dish was indeed a standout (salty, fried goodness!) and would be a good option in lieu of a mock dish as it's something a bit special. The roasted 'duck' is possibly the best mock duck I've had, it was crispy and succulent and the plum sauce topped it off nicely. The chinese mushroom and pok choy was fine, albeit a little soggy from it's trip in the takeaway container and the satay skewers were just ok (I found the peanut sauce to be a bit bland). 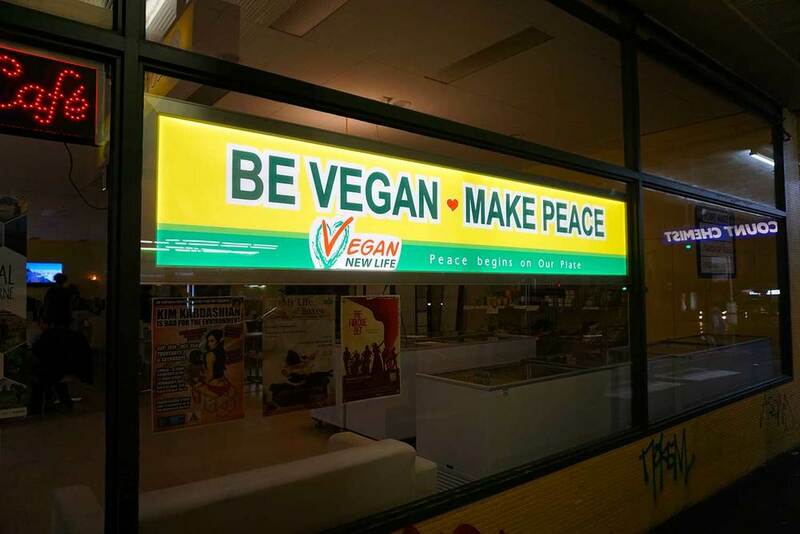 I would definitely go to Vegie Mum again if I was out that way, and I reckon Doncaster residents are darn lucky to have this place on their doorstep. Note: No onion or garlic is used at Vegie Mum. Mock products are made using wheat gluten and soy protein. Also visited by: where's the beef?